Pop culture has notoriously sexualized and objectified the ideal body image, using it as a tool of productivity. The idealized body is the focal point of nearly every commercial and is the center of any noteworthy ad. The commodities that are actually being advertised, such as food or cars, are worth nothing without the commodities that the bodies posing for it actually bring. These advertisements aren’t really focusing on the product, but in fact on the body image itself. In making these bodies into objects of ultimate beauty and desire, advertisers are glossing over the fact that, in this scenario, the body is merely an item. They are teaching us that the body is an object to be used, and our beauty and desirability are measured only by how closely we fit into their constructed reality. As a whole, our culture is consumed by the way our bodies look and it is the images on television and social media that we try to emulate because we are conditioned to believe we are supposed to look, dress, and act like what is presented to us. Body modification is on the rise—implants, piercings, tattoos, extreme dieting—as we try to fit into this construct delivered through television. In a sense we are killing ourselves (our natural self) trying to fit the mold (or stand apart from it). 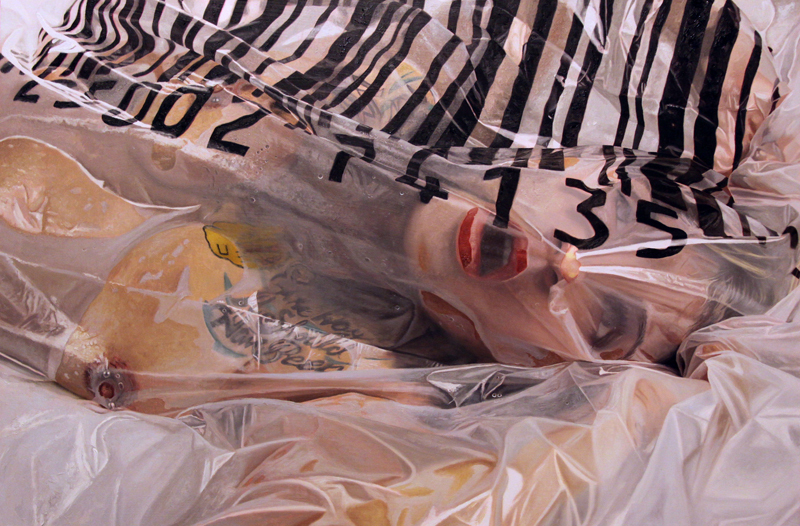 In my paintings, a figure is under clear plastic. The original function of plastic is to protect, but here it could suffocate—is the figure alive or dead? 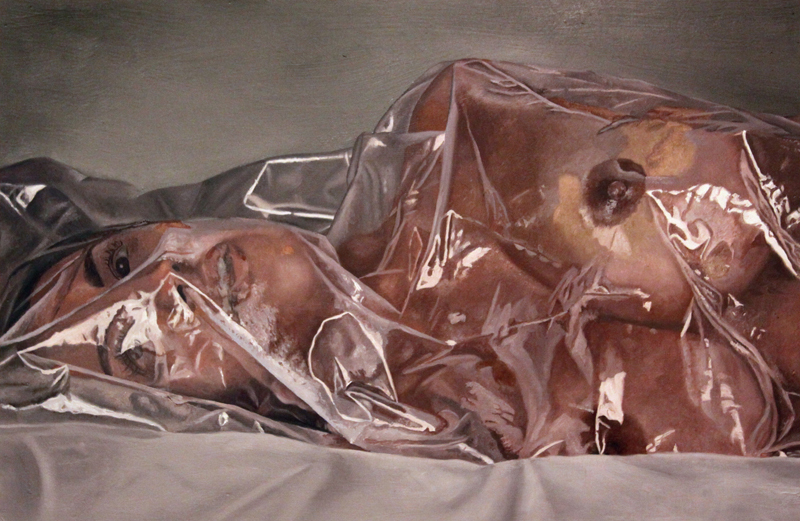 The paintings are seductive and yet disturbing. I want them to function in this manner as it evokes the American art and culture critic, Dave Hickey and his notion of transgressive beauty; the beauty/ugly duality that arises as the viewer is intrigued (by the sexiness of flesh) and repulsed (by the figure under plastic and title) when they look at the image. 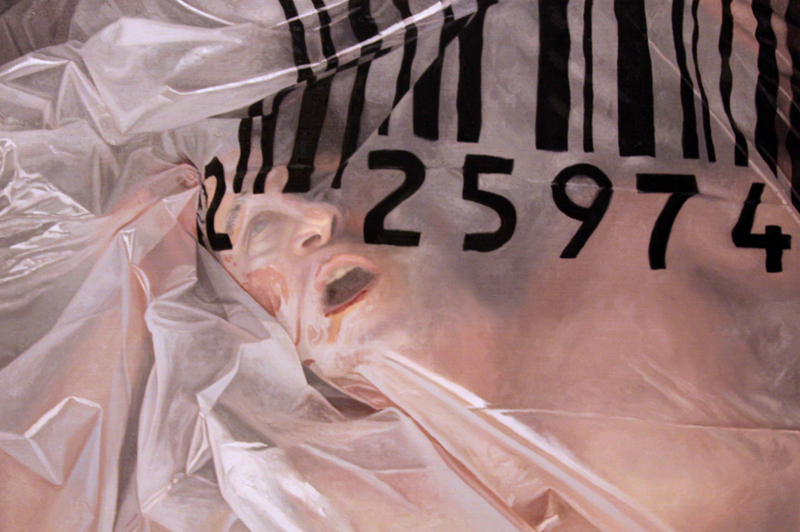 The plastic carries a large barcode, which is imprinted on the figure. The barcode is specific to different types of meat that can be found (and scanned) at the supermarket. 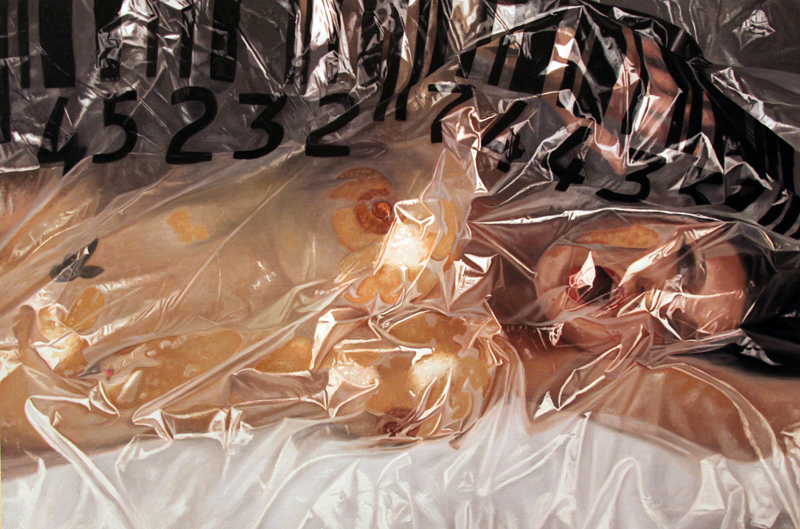 In essence the figures are being wrapped in plastic like meat at a grocery store, ready to be consumed. The titles are bluntly descriptive of various meats so that the viewer cannot avoid learning about the true identity of the subject they are looking at. 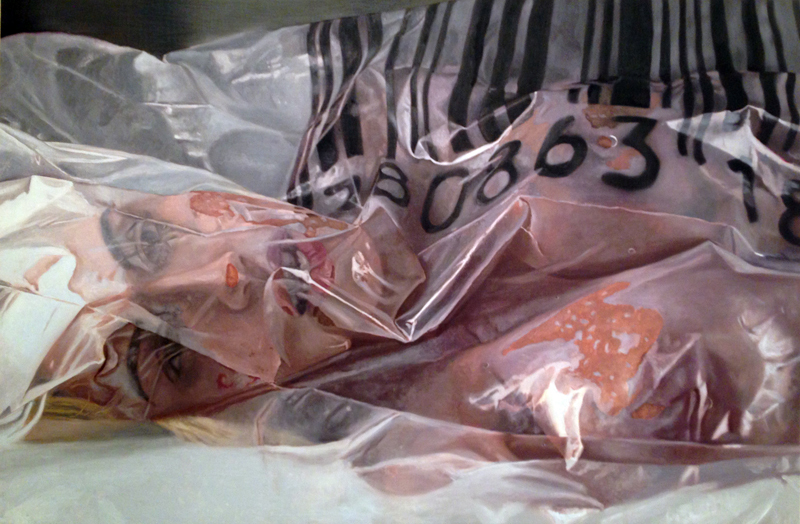 Hopefully the clash between the form and content unites culturally constructed codes of desire with substances usually considered repugnant; the idea of people wrapped in plastic like meat that can be bought and consumed. 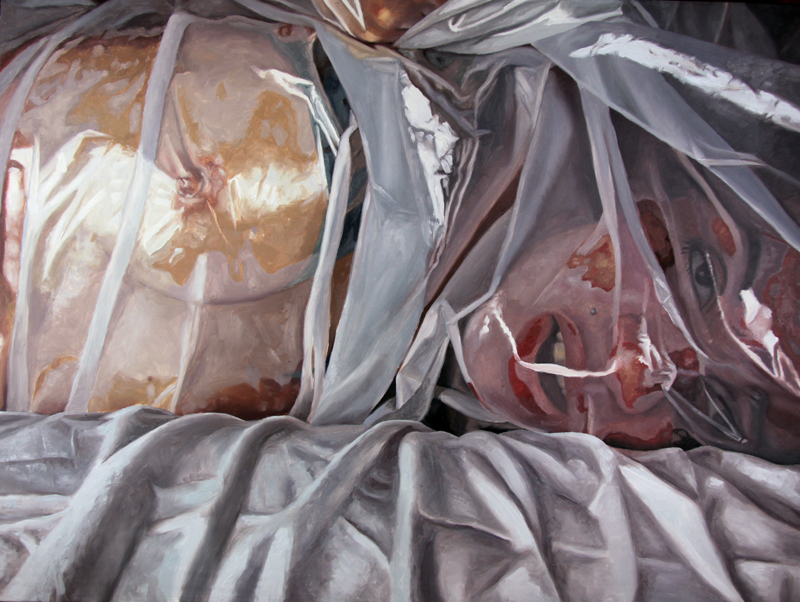 I hope my work seduces the viewer with its sexiness and realistic flesh while exploring themes of excess and consumption that question the culture in which we live.